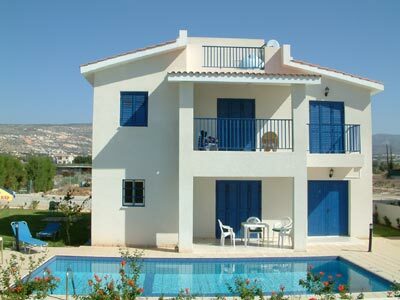 Standing at a distance behind Villa Kleo, Villa Thalia has its own large beautiful garden and enjoys nice side sea views. It has its own pool to the front of the villa and also has a children's pool to the side of the main pool. There is a sunbathing terrace surrounding the pool on which to enjoy the endless Cypriot sunshine. A patio in front of the villa has table and chairs and patio doors leading into the villa's dining area. Inside the villa on the ground floor is an open lounge/dining room and kitchen. The lounge has comfortable seating, a coffee table and a television whilst the dining area has a table and chairs. 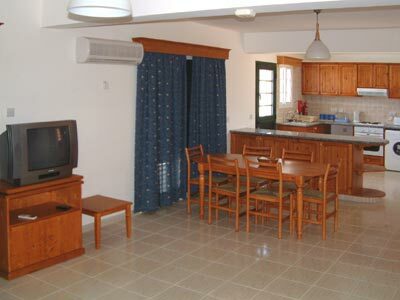 The kitchen is equipped with an electric oven and hob, microwave, washing machine, dishwasher and fridge/freezer. Completing the ground floor accommodation is a shower room and a back door leading to a terrace at the back of the Villa. The bedrooms are all upstairs on the first floor, there are two twin bedrooms with air-conditioning / heating and a shared balcony overlooking the pool and one double bedroom with en-suite shower and shared balcony with the other two bedrooms. There is also a separate bathroom on this floor.